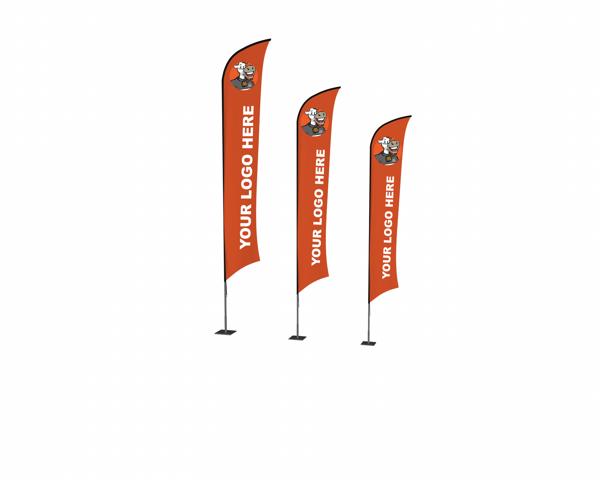 Our feather flags are supplied with an aluminum pole and a digital printed flag. You can choose between our standard cross base/spike base or integrated flag holder for your feather flag. Upload your artwork for your order below. If you are using one of our supplied templates, please review our artwork specifications guideline for file types accepted. If you do not use one of our templates, you will be subject to an art surcharge. Our standard art rate is $125.00 per hour. All custom themed graphic selections (Chairs, Growth Charts, Garage / Floor Coverings) will be subject to a $95.00 surcharge. If you have any additional information that you would like to share about your order please let us know. 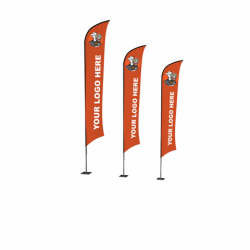 Our feather flags are supplied with an aluminum pole and a digital printed flag. Sign Up For Our Store Newsletter and Receive Specials and Updates on Our Products. If you need to login, register or view your account please visit the "My Account/Login" page. Due to the unique sizing and weights of our products we are unable to automatically calculate shipping to ensure you are charged fairly. 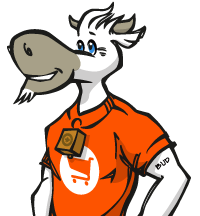 To make sure you get the best shipping price possible we will calculate your shipping options personally after your order has been placed. After you have finished ordering we will have a sales representative calculate both a regular and express shipping price for you as soon as possible. 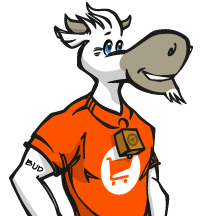 Your payment for your order WILL NOT be processed until we have received email approval of your shipping cost from you. With over 135 staff, multiple locations, multiple printing platforms, engineering, fabrication, installation, and graphic design, allows us to be very versatile and understanding from conception to completion when getting your brand on! Operating out of Edmonton, Calgary and Saskatoon and Toronto, empowers Cowan Graphics to supply all markets – small, medium and large with an extensive offering of corporate branding services such as; Decals, Signage, Vehicle branding, large-format graphics and a whole lot more. If you would like to contact a specific branch please visit our contact us page. For general information you can either email us at info@cowan.ca or call our toll free number 1-800-661-6996.